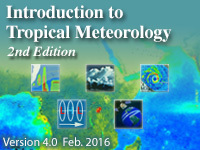 This chapter covers remote sensing, the primary method of observing weather and climate across the global tropics. Learners will become familiar with the scientific basis and applications of radar and satellite remote sensing from examples in which clouds and precipitation are observed by measuring microwave signals using ground-based radar, spaceborne radar, and satellite radiometers. Wind estimation, dust and volcanic ash tracking, vertical sounding techniques, and remote measurement of sea-surface, soil and land surface properties are also covered. My primary concern with this lesson as with others is that you don't know which answers you missed in the multiple response quiz questions, making it difficult to figure out what you need to go back an review. This lesson increased my understanding of remote sensing in tropical meteorology. It is very interesting but the answer is needed! This lesson is very helpful as it is very detail and specific in its content and I although it is my first time to come across some of the informations I enjoyed it and would suggest to other work mates to sign up and learn from these resourceful informations. The lesson was very educative, well formatted. I has a great emphasis on aviation hazards which is quiet in line with the course. Not a level 1 course, nor does it take 1-1.25 hours. Otherwise a nice course.